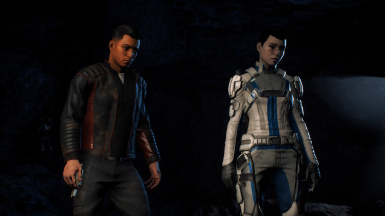 Appearance swap for Reyes, replacing his Exile outfit with leather jacket. Compatible with outfit retextures. 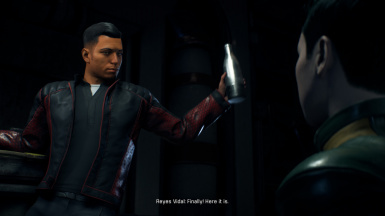 This is a small mod that swaps Reyes' default outfit (human exile) with male Pathfinder's Leather Jacket. To ensure compatibility with texture mods, installation is modular: textures can be applied separately, from any mod you prefer. 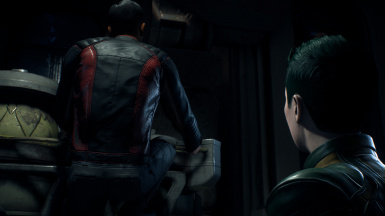 I tested it with Kadara scenes I had saves for, but not all (yet). Let me know if you encounter any problems (especially with endgame). shirt_textures are SHARED by most casual outfits (shortsleeve, longsleeve and male jacket) and this retexture will remove any tinting possibilities. It's a quick recolor I made for myself because I don't use these outfits anyway, but most players SHOULD AVOID this one. 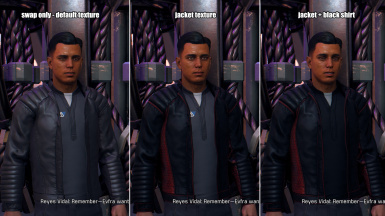 Similar with jacket textures, these modify male casual_04 outfit, removing any tinting / customizing options. All made possible thanks to Ehamloptiran and his Frosty Tool Suite. Some screenshots might show (off :D) Ravashing Reyes Vidal mod by MokChaoticran.